Looking for the most perfect deals on flights with British Airways? Then, you have to look no further as your search ends right here. 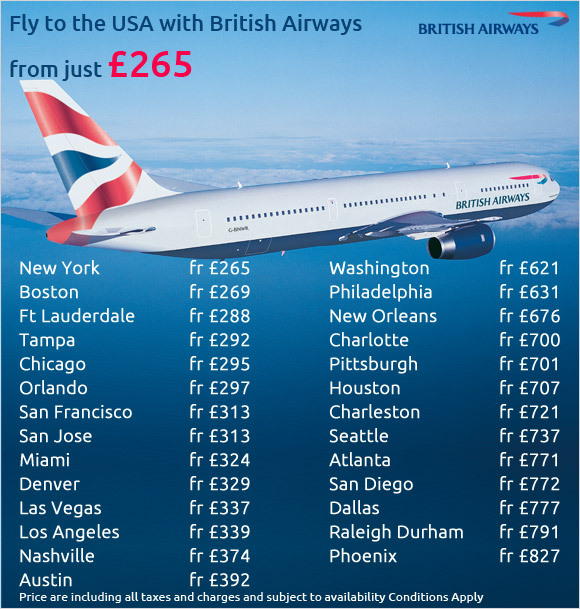 Recognized as the largest airline in the UK, British Airways is the flag carrier airline of the United Kingdom. Founded in 1974, British Airways or BA has its prime hub at London Heathrow Airport and is contemplated to be the biggest UK airline based on its fleet size, international flights and worldwide destinations. The airline flies to over 300 destinations from UK to across the globe. When you are on board the flight, what you experience is simply beyond words as the service and comfort take you on an exceptional joy ride. The service provided by the airline in all its classes is simply beyond compare because the passengers are treated with respect and courtesy and above all, they are treated as if they are at their respective homes. British Airways’ main base is at London Heathrow Airport that is located in West London, England. However, it also holds a foremost presence at Gatwick and Manchester Airport. The Heathrow-based airline has been honoured with various accolades for many years. In April this year, the British Airways Galleries Club Lounges have been announced as the winner of the “World’s Best Business Class Airline Lounge.” This prominent award was given on the basis of the customer service, the product and the top-notch quality service that’s offered in the lounges at London Heathrow Terminal 5. The airline lets you take to the air in comfort and style with exclusive range of business class services that offer lounge access, lip-smacking meals and the list does not come to a cease. If you are travelling by the British Airways’ World Traveller Class, you truly are in for a surprise as the airline comprehends that a flight is much more than just touching down at your destination. So, if you are heading to a specific location for a city break, beach or ski holiday, you can grab hold of laid-back experience and let the airline do the rest for you so that when it’s time for you to get off the airliner, you are relaxed and filled with energy to look forward to a soothing vacation you have always dreamed of. Save your precious time at the airport using a check-in kiosk. You can get in touch with pleasant-natured ground staff for any assistance you seek. 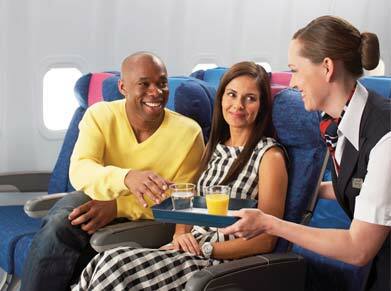 A team of experts will make your flight experience a comfortable one as they go on providing warm and caring service. You can take delight in the delicious three course meals prepared by the leading chefs on board. The seats are ergonomically designed to provide you the utmost level of comfort that you will relish throughout the course of your flight. What’s more? Soothe your journey with blankets, cushions, eyeshades and flight socks. Take charge of High Life Entertainment’s Audio and Video On Demand (AVOD) that gives you a privilege to choose from over 200 entertainment options. Free baggage allowance of up to 23kgs. Those who are looking forward to make the most of their journey will not ask for less than travelling in premium economy in World Traveller Plus. Feel contented as you derive pure pleasure from added extra privacy, relaxation and proficient service. The airline lays an emphasis on the fact that you arrive in better shape so that you can take pleasure in your holiday or start a day’s work. 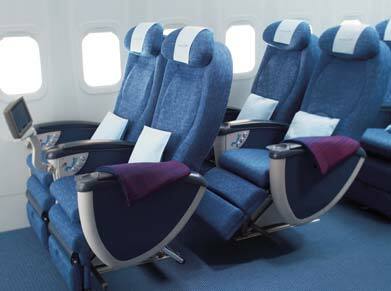 The airline’s unmatched premium economy network indicates that you can fly with ease to over 70 global destinations. From the comfort of your home, office or hotel, you have the flexibility to choose your seat and print your Boarding Pass. You can choose to fax, email or save your Boarding Pass so that you can print the same as per your convenience. You can enjoy some of the finest airport shopping in the world as most of the British Airways UK World Traveller Plus flights leave from Terminal 5 for their respective destinations. Prior to boarding your flight, you can simply grab a drink and light snack. Have the benefit of enjoying more room aboard. With the private dedicated cabin equipped with a maximum of six rows, you can certainly look ahead to stretch out. Also, get pleasure from the complimentary bar facilities at your service in a larger seat with leg rest, lumbar support, etc. Let the sunrise start with a level of comfort. Choose a complimentary newspaper to keep pace with the outside world. Feel at ease with cushion, blanket and amenity kit that make your journey a cherished affair to remember. Look forward to take your taste buds on an exciting tour to a three-meal for breakfast, lunch or dinner. Also, grab a wide range of special meals to suit different tastes and dietary requirements – from gluten free to kosher. World Traveller Plus seats are loaded with a personal screen and headphones that lessen the noise. Just sit back and treat your eyes with the latest films, TV programmes, games, audio books, music and radio. Baggage allowance of two free checked bags up to 23kgs. British Airways welcomes you to Club World! 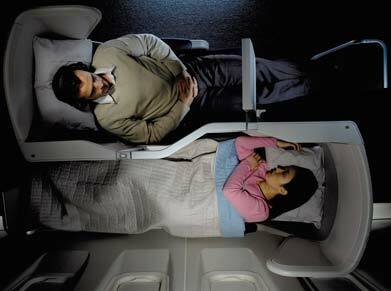 Club World long-haul business class is designed as per various needs. The instant you set foot on the airliner to the moment you reach your destination with us, we emphasize on the fact that every need is catered to just as you ask for. Whether you are aboard the flight for business or pleasure, you are among the privileged ones who can sleep, work or simply relax so that when you reach your destination, you are refreshed for the day. When you have the facility to check-in online, you can reserve your favourite seat on-board. Choose your seat 24 hours before the scheduled departure time of your flight on ba.com or on your mobile phone by accessing ba2go.com. Travelling with bags? Drop your bags at one of the Bag Drop desks when you reach the airport and speed through Fast Track security to the lounges. Let the outside world pass you by with the touch button privacy screen that attaches you in your own personal space. So, put your feet up and blow your mind with a glass of champagne. Want to grab hold of luxury wash bag? It has everything that is needed to soothe yourself that includes Elemis in-flight skincare products, toothbrush, toothpaste, eye mask, earplugs and flight socks. How about stretching out in absolute comfort on a luxurious bed? You can sleep well on a 25 inches wide bed with a cosy quilt. Want to satisfy your appetite? Club World’s menu is designed by some of the top chefs of the world. The menu is a fine blend of the most unmatched local and international produce in a wide range of superb dishes to satisfy every foodie. Take charge of a world of entertainment at your fingertips. It’s hard for you give in to the level of entertainment that you get in Club World. You can settle down while watching a movie or listen to some of your favourite music. 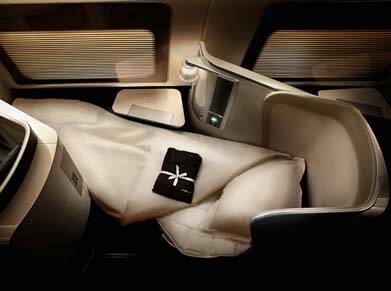 A new experience awaits your touch of discovery with the First Class of one of the most elite airlines in the world. This extraordinary class graces you with levels of comfort and refinement. The cabins redefine panache and they make you feel at home with their first-class service. It’s like an unbeatable retreat in the sky where you are the master of your discretion. Welcome aboard! Be the first to have the benefit of the service that is offered at the dedicated First check-in desks at selected airports. The friendly staff will cater to your various needs so that you can spend more time comforting in one of the exquisite lounges, like the Concorde Room at London Heathrow Terminal 5. With your internet-enabled mobile phone, you can logon to ba2go.com to check-in from wherever you are. You can also use rapid and easy touch screen check-in kiosks at the airport. Grab a stopover at any one of over 60 dedicated British Airways lounges and 90 partner lounges located worldwide and pour tranquillity on yourself so that you can rejuvenate before your journey. Be the privileged one to have a popular option of dining if you desire to get as much sleep as possible. The airline firmly believes in serving your needs than the rest. That’s why there is a First, a helpdesk service that has a dedicated phone number if you are a First customer. You can be assisted with any query that you may have from booking till the time you return home. We have launched the new First suite and cabin and invite you to discover an improved experience on board the flight. Should you decide that you want to sleep early, slip into soft cotton pyjamas and ask for the Turndown Service at any time of the day. Calm down with a chilled champagne cocktail as you think about the delights of the First menu. There is something to suit every taste. Take a fine look at the menu that is designed with the discretion of some of the world’s finest chefs. Settle down and let the First entertainment system take you on a joy ride. You can watch movies, play games, etc. and can choose from a wide choice of 100 movies, a selection of TV programmes, music CDs and audio books. There’s something to pacify every mood and taste.